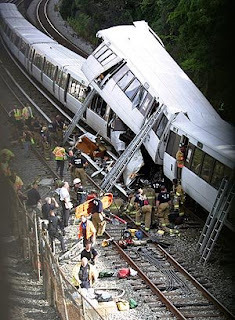 Here's a Washington Post narrative piece on the Metro train that crashed, focusing on a handful of passengers and built around a last-one-on, last-one-off structure. There are a lot of things to take from this story, but here's one that struck me: The detail of the guy walking from the front of the car to the back. It happens early in the story. The writer notes that this guy was all about protecting his personal time, and being in the back of the car put him closer to where he wanted to go when he left the train. "That seemed important," the story says. And it was, as you'll find out. But the reporting tool to take from this is: Clearly, the reporter asked the guy to recreate everything he did on the train. When the guy said he walked from the front to back, the reporter had to have asked, "Why did you do that?" And the guy must have answered, to save time. How much time? the reporter might have asked? A few seconds, the guy may have answered. But the reporter didn't stop there. He/she must gone on to a Metro train and paced it off -- allowing him/her to give you the info that, basically, nine seconds made the difference for this guy. For a narrative, no question is too small, no answer insignificant. You need everything you can get, because only when you have that can you truly take someone through the crucial scenes in your story (or, in this case, the entire story). I just started to blog about this story. It's a fantastic piece of writing. p.s. That deleted comment was mine.